REPA Inc. aims to contribute positively to the planning process in ways which will preserve the rural amenity of the district which now comprises the major part of the Pullenvale Ward. REPA Inc. is a community-based planning association which has been active in the Brookfield-Pullenvale- Moggill area, and adjoining rural suburbs, since 1973. There are currently (mid-2015) several development applications for properties in Moggill that are located within a "Koala Assessable Development Area" (KADA). These are subject to certain regulations regarding vegetation clearing. REPA considers that all the remaining koala habitat in Moggill needs to be preserved if the koala population there is to be retained. REPA has objected to several subdivision proposals. 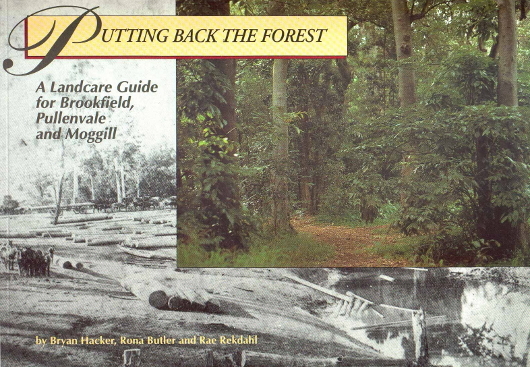 Now freely available online, Putting Back the Forest is a landcare guide for the semi-rural district of Brookfield, Pullenvale and Moggill. This guide provides practical advice on selecting, planting and caring for plants native to the area. Trees, shrubs, vines and ferns are all detailed with illustrations in this wonderful guide. There have been various reports of illegal dumping in our district. Please report any illegal dumping to the City Council Call Centre, 3403 8888. It’s available 24/7. 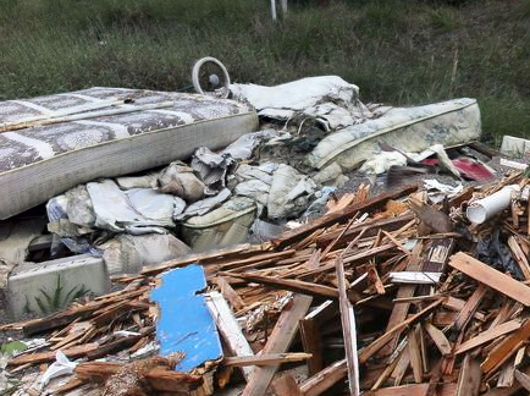 The State Government has an online reporting capacity at https://www.ehp.qld.gov.au/waste/illegal_dumping_litter.html . The website also has some useful information about Government initiatives to combat littering and illegal dumping. REPA's is a voluntary organisation committed to maintaining a rural residential lifestyle. In the past members have contributed financially as an annual subscription which REPA uses to support legal actions. Some members have also contributed their skills for the benefit of the organisation. In the past this has included free or discounted environmental evaluation and legal representation. The aim of REPA Inc. is to contribute positively to the planning process in ways which will preserve the rural amenity of the district which now comprises the major part of the Pullenvale Ward. REPA Inc. is a community-based planning association which has been active in the Brookfield-Pullenvale-Moggill area, and adjoining rural suburbs, since 1973. REPA operates for the long-term benefit of local residents and the balanced development of the City of Brisbane and also participates in local environmental community projects. We thank all those who have renewed their membership for 2016, and we especially thank those who have made a donation as help is needed with our Court costs. If you have not yet renewed your membership for 2016, you can do so by completing our online REPA MEMBERSHIP FORM. REPA is currently (June-July 2015) involved in three court cases regarding local developments. One of the three court cases has recently been 'struck out'. This was Appeal 3383/12 (land at 3334 Moggill Road) in which the owner appealed against the Council for refusing his application to subdivide nearly 12 ha into 26 lots on well vegetated land in Moggill. REPA is of the opinion that its participation in the case reinforced Council’s position regarding refusing the application and may well have contributed to the case being 'stuck out', though that now may be challenged. The outcome is good news for that piece of land which is connected to other areas of good habitat and also good news for several neighbouring residents. REPA is still pursuing the other two court cases, in both of which REPA has elected to be a Co-Respondent in support of Council’s refusal of the respective proposals. These cases are carefully reviewed by REPA at each of our Committee meetings. Please join REPA to receive additional information regarding these court cases. We thank all those who have renewed their membership for 2015, and we especially thank those who have made a donation as help is needed with our Court costs. If you have not yet renewed your membership for 2015, you can do so by completing our online REPA MEMBERSHIP FORM. 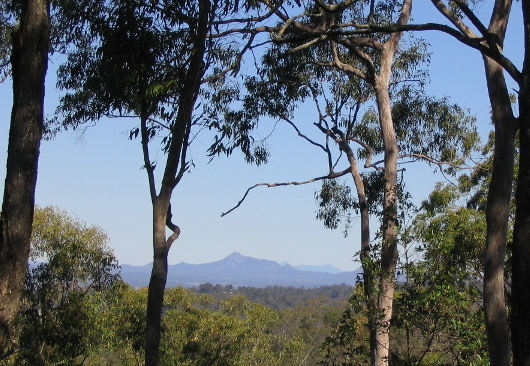 There are currently (mid-2015) several development applications for properties in Moggill that are located within a "Koala Assessable Development Area" (KADA). These are subject to certain regulations regarding vegetation clearing. 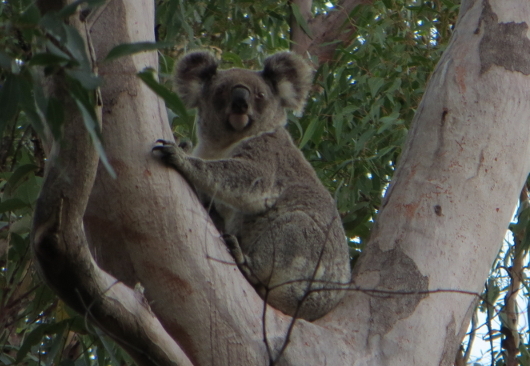 REPA considers that all the remaining koala habitat in Moggill needs to be preserved if the koala population there is to be retained. REPA has objected to several subdivision proposals, two are currently the subjects of appeals by the developers. Others are still in the planning stage. The Appeals are both in the Planning and Environment Court, Nos 3383/12 and 144/14. Details may be accessed on the eCourts web-site as indicated under Moggill Country Club.